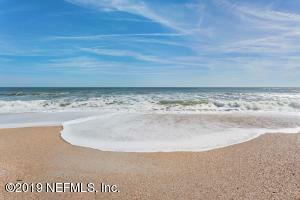 RARE OPPORTUNITY FOR AN 85 FOOT WIDE LOT LOCATED AT THE SOUGHT AFTER NORTH END OF SOUTH PONTE VEDRA BEACH. THE TOPOGRAPHY OF THE LOT WILL ALLOW A VIEW OF THE OCEAN FROM THE FIRST FLOOR. A FAVORABLE OPINION LETTER IS ENCLOSED IN THE DOCUMENTS FROM THE FLORIDA DEPARTMENT OF ENVIRONMENTAL PROTECTION (FDEP) FOR A 50 X 32 FOOT HOME WITH AN 8 FOOT CANTILEVERED DECK ON THE BACK OF THE HOME. This home has been on the market since Jan 21,2019. Courtesy of MARSH LANDING COUNTRY CLUB REALTY LLC.